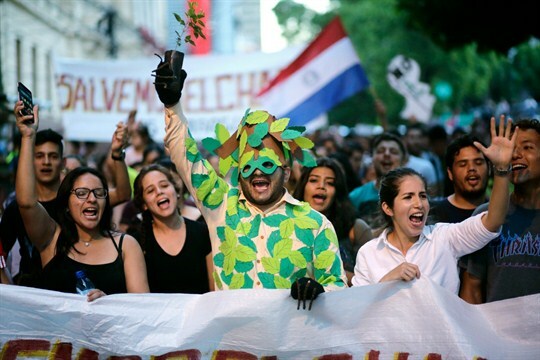 Paraguay’s main opposition party recently introduced a bill offering conscription-age youth an alternative to mandatory military service: replanting trees in depleted forests. The reforestation proposal highlights the seriousness of environmental degradation in Paraguay, mainly driven by the clearing of forests for agriculture, which has sustained one of Latin America’s highest economic growth rates. In an interview with WPR, Joel E. Correia, an assistant professor of Latin American studies and core faculty member in the University of Florida’s Tropical Conservation and Development Program, discusses deforestation in Paraguay and its disproportionate impact on the country’s indigenous peoples. World Politics Review: How serious is the degradation of forests in Paraguay, and to what extent has the country been able to address this issue through conservation policies? Joel E. Correia: Paraguay has an extremely serious problem with deforestation, mainly driven by agricultural practices like soybean production and cattle ranching. Numerous studies by academics, NGOs and international development agencies have utilized geospatial analysis and remotely sensed data to determine the extent of deforestation across the country. In southeastern Paraguay, the Interior-Atlantic Forest once covered 9 million hectares—more than 22 million acres—but by the mid-2000s, 93 percent of it had been cleared for agricultural purposes. The expansion of cattle ranches driven by increasing global demand for beef and dairy products is causing extensive deforestation in western Paraguay, a region known as the Chaco. The semi-arid Chaco is the second-largest forest ecosystem in Latin America, with great biological diversity. But it is now the site of some of the world’s fastest rates of deforestation, losing nearly 250,000 hectares of forest cover annually between 2001 and 2014, or nearly 3.5 million hectares in total. Paraguay’s government has tried to curtail deforestation through laws and environmental policies. The 2004 Law of Zero Deforestation has helped protect remaining stands of Interior-Atlantic Forest, with some studies noting that the rate of deforestation in the region slowed by 85 to 90 percent in the years after it was enacted. But while that is certainly laudable, the damage had already been done; only 7 percent of the Interior-Atlantic Forest remains in this part of the country and it is still being degraded. Furthermore, studies suggest that more stringent deforestation laws in the southeast resulted in the “leakage” of deforestation from the Interior-Atlantic Forest to the Chaco region in the west, where the laws did not apply. Deforestation in the Chaco accelerated with the intensification of soybean production in the southeast, because cattle production was pushed westward where land was cheaper and not amenable to soybean production. While the Forestry Law requires that 25 percent of rural properties in the Chaco maintain “natural” forest cover, in practice, compliance with the law often results in the creation of a highly fragmented forest landscape comprised of hedgerows and islands that maintain minimal habitat. Due to the difficulty of access and general lack of government officials present in the region, enforcement of deforestation laws is relatively lax in the Chaco, effectively contributing to continuing deforestation. WPR: How politically important is environmental conservation in Paraguay today, and who is setting the agenda? Correia: Paraguay has exhibited some of the region’s strongest economic growth in recent years, with GDP rising by nearly 4.5 percent annually between 2004 and 2017. Much of this growth has been driven by the agriculture sector and its continued contributions of export commodities to global markets. For example, Paraguay is currently the world’s fourth-largest exporter of soybeans, and it ranks among the top 10 beef-exporting countries by total tonnage. This reality complicates the question of environmental conservation and its political importance. The historic and contemporary rates of deforestation suggest that environmental conservation is secondary to an economic growth imperative based on agricultural exports. On the other hand, some suggest that forestland conservation and agricultural expansion do not have to be mutually exclusive. Initiatives such as the Roundtable on Sustainable Soybean Production and efforts to maintain ecosystem connectivity through forest hedgerows on Chaco cattle ranches purportedly intend to minimize environmental degradation. Having said that, concern for environmental conservation is minimal compared to the political importance of maintaining and expanding agricultural industries that have driven much of the country’s present-day changes in land cover. The expansion of the agriculture industry builds from a history of problematic land tenure issues and directly affects ongoing issues of social and environmental injustice with regard to land tenure inequality and the disproportionate effects of environmental change on marginalized communities across the country. While there are important initiatives taking place to promote forest conservation in Paraguay, the balance of power is clearly in favor of economic growth at the ultimate expense of the environment. One only has to look at the Chaco to see how that imbalance is driving deforestation today. WPR: What impact has deforestation had on Paraguay’s indigenous communities, and how do their voices and interests factor into conservation policies? Correia: It is difficult to make blanket statements about the effects of deforestation on indigenous communities in Paraguay due to the diversity of indigenous peoples and the challenges they face. Two percent of Paraguay’s population identifies as indigenous, yet there are 19 different indigenous peoples in the country. Considering this diversity, recent reports from the United Nations Special Rapporteur on the Rights of Indigenous Peoples and the Open Society Justice Initiative show an alarming trend: Indigenous peoples often do not have a place at the table to influence the policy decisions and development initiatives that affect their communities. This is partly evidenced by the fact that Paraguay has no law or clear policy framework to facilitate protocols of free, prior and informed consent, as required by the International Labor Organization’s Indigenous and Tribal Peoples Convention, which Paraguay ratified in 1993. Moreover, the government agency that is charged with adjudicating indigenous affairs is one of the least-funded federal entities in the country. While there is a national legal framework to support indigenous rights, in practice, indigenous communities are often disproportionately affected by deforestation due to a lack of access to secure land tenure and a general lack of institutional support for their well-being. In fact, Paraguay has been condemned three times by the Inter-American Court of Human Rights for failing to ensure constitutionally guaranteed access to ancestral lands for indigenous communities in the Chaco, and the Inter-American Commission on Human Rights has had to arbitrate numerous settlements between indigenous communities and the Paraguayan state. Many of the cases that have come before the Inter-American Human Rights System are related to deforestation and environmental change, including an ongoing case concerning the Ayoreo Totobiegosode people, who are in voluntary isolation and are threatened by the expansion of ranching in the Chaco. Though indigenous influence in state government has been historically limited, the cases before international courts have helped some communities secure land title. Indigenous communities have also seen some success by allying themselves with NGOs and academics, such as the move in 1991 to protect the Mbaracayu Forest Reserve in southeastern Paraguay and the ongoing efforts, both in the Inter-American System and domestic courts, to secure indigenous land tenure in the Chaco.